The European Space Agency's XMM-Newton has found a pulsar — the spinning remains of a once-massive star — that is 1,000 times brighter than previously thought possible. Astronomers have discovered the brightest neutron star ever found. This extremely dense object is 1,000 times brighter than researchers previously thought was possible for neutron stars, which are the remnants of star explosions, a new study finds. The extreme brightness of this neutron star can be explained only if it has a complex magnetic field with more than two poles (rather than a simple magnetic field with just a pair of poles), the scientists behind the new work said. Prior work suggested that the most likely engine driving ULXs are black holes ripping apart tons of gas and dust that are falling or accreting onto them, perhaps off a nearby ill-fated star. Researchers suggested that these black holes had masses ranging from about 100 to 10,000 times that of the sun, according to the researchers. Still, in the past three years, astronomers have discovered neutron stars capable of giving off up to about 10 million times more energy in X-rays per second than the sun does in all kinds of light, suggesting that some ULXs may have neutron stars at their hearts. Neutron stars, like black holes, are remnants of stars that died in catastrophic explosions known as supernovas. When a star goes supernova, material will collapse down into a dense core. If the core is massive enough, it may form a black hole, which has such a powerful gravitational pull that not even light can escape. A less massive core will form a neutron star, which is less dense than a black hole and can radiate light. Although neutron stars are typically small, with diameters of about 12 miles (19 kilometers) or so, they are so dense that a neutron star's mass may be about the same as that of the sun. Neutron stars, like black holes, can give off huge amounts of energy as their powerful gravitational fields rip apart material accreting onto them, which may be how a ULX creates those incredible bursts of X-rays. NGC 5907 X-1 is the brightest neutron star discovered yet, blasting out up to about 55 million times more energy than the sun per second. In one second, it emits the same amount of energy released by the sun in 3.5 years, the researchers said. The researchers used the European Space Agency's X-ray Multi-Mirror Mission (XMM-Newton) and NASA's Nuclear Spectroscopic Telescope Array (NuSTAR) space telescopes to examine a ULX known as NGC 5907 ULX (the object now known as NGC 5907 X-1). This X-ray beacon is located about 55.7 million light-years away, in the relatively nearby spiral galaxy NGC 5907, also known as the Knife Edge Galaxy because of the way it is oriented edge-on compared to Earth. ULXs that are black holes are expected to give off constant streams of X-rays. Instead, NGC 5907 ULX emitted X-rays in a pulsating manner. These pulsations "are an unambiguous signature of the presence of a pulsar, a magnetized, spinning neutron star," study lead author Gianluca Israel, an astrophysicist at Italy's National Institute for Astrophysics in Rome, told Space.com. Each pulsar shoots out two narrow beams of light in opposite directions, and if aligned with Earth, these beams act as a lighthouse beacon, appearing to flash on and off as the pulsar rotates. This new ULX is the most distant pulsar discovered yet, the researchers said. Archival data suggested that this ULX is accreting material so fast from a companion star that the rate at which it spins has accelerated at an astounding rate. The amount of time it takes for this ULX to spin once on its axis has shrunk by 300 milliseconds over 11 years, from 1.43 seconds in 2003 to 1.13 seconds in 2014. "If you think of this in terms of Earth's rotation, it's like the duration of the day reduced by 5 hours in the same amount of time, 11 years," Israel said. At its peak, the luminosity of this ULX exceeds the theoretical maximum set by the balance of the energy radiating outward and the gravitational force acting inward — the so-called Eddington limit — by about a whopping 1,000 times what would be expected for a neutron star. Standard models of neutron stars that assume a simple magnetic field with two poles cannot explain these findings, the authors of the new work say. Instead, the scientists' computer model suggested that a strong, complex magnetic field with more than two poles could help a neutron star accrete more matter onto it than previously thought. "This matter, falling on the neutron star, ultimately produces the emission that we detect as X-rays," Israel said. It remains uncertain just how many poles NGC 5907 X-1 possesses, and how exactly they are arranged, Israel said. 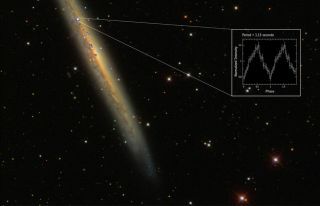 Future research can further examine this neutron star and its companion star to learn more about why this pulsar is so luminous, Israel said. "Our results are already prompting new models able to account for the formation of ultraluminous X-ray pulsars and understand in detail the physics beyond their incredible energy emission," Israel said. It remains unknown how many ULXs host neutron stars, as opposed to black holes. "This is one of the questions the scientific community needs to answer in the next years," Israel said. The scientists detailed their findings online Feb. 19 in the journal Science.